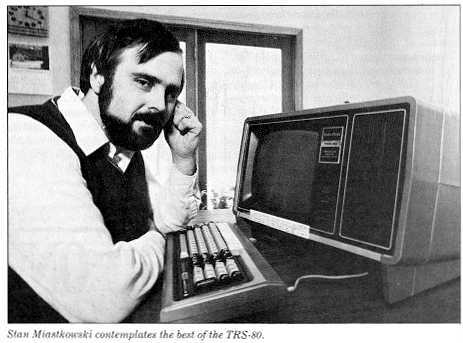 Stan Miastkowski is the computer columnist for Esquire and editor-in-chief of Microcomputer Handbook. Okay, I'll come right out and say it: I own a TRS-080 (Model II, to be exact). When computer people get together, I sit quietly in the corner, a computer wallflower listening to the intelligentsia talk about their IBM PCs, TI Professionals or the latest hot personal computer they've added to their collection. "And here I thought you knew about personal computers!" Admit it: it's the "Shack" name that creates the impression of "Friendly Fred's Reliable Computer Sales." Despite their location in Fort Worth, away from the hi-tech circles of Silicon Valley, the Radio Shack people are far from being just a bunch of Texas hicks. I know whereof I speak, because I once worked in Tandy Center. Radio Shack's TRS-80 Model I had been out for over a year, and in that hot Texas summer of 1979 the Model II was being designed by a team of young engineers. I watched it progress from an idea to a finished computer. Using the best components and helped by the Shack's quality control department, the engineers developed a no-nonsense business computer. A year later I was in New Hampshire. I needed a computer for my writing, and one night the thought that had been buried at the back of my mind surfaced with a vengeance: "A Model II, of course!" The next morning I sat outside the store and waited for the doors to open. I knew how to handle Radio Shack salespeople. I regaled them with the story of the Model II's birth, and put my fingers to the keyboard of what seemed an old familiar friend. Sure, it wasn't cheap, but how can you say no to a friend? I handed over my "never leave home without it" card, and by afternoon a Model II was comfortably settled in my office. The reacquaintance was underway. Three years have passed, and my Model II still hums away contentedly after three books, dozens of magazine articles and uncounted letters. The hundreds of disks that have passed over its read/write heads are arranged like soldiers on the shelf-a library of programs and data that has served me well. And I'm smug in my satisfaction that if something should go wrong, my salvation is two miles away, not forty. Whenever I pass a Radio Shack store, I salute my former colleagues at Tandy Center. with its idiosyncrasies. I know that if I turn the power off before removing my disks, all the data on the disks will be lost forever. In addition, after a bout of eyestrain and headaches, I had to replace the black-and-white video tube with an amber-tinted one. But when deadlines press I know the Model II will come through in the clutch. Although familiarity is supposed to breed contempt, it's a fact that people are most comfortable with the personal computer and the word processing program they first use. I started using SCRIPSIT (Radio Shack's word processor for the Model II) in 1979. In the interim I've used and reviewed numerous word processing programs, many touted as the ultimate in user-friendliness; but I still return to SCRIPSIT, where I can do wondrous things without even thinking about them. Incidentally, the computer nerds may not have Radio Shack to kick around much longer-not because the Shack's going out of the computer business like a few of its once high-and-mighty competitors, but because the executives in the top-floor oak-paneled offices at Tandy Center in Fort Worth have finally come to their senses. The company's "IBM-compatible" is no longer called Radio Shack. Instead, it's the Tandy. And that's just dandy.